Quietly announced in an update to Apple Music's feature availability webpage, lyric support is now live in France, Germany, Ireland, Mexico, New Zealand, South Africa and Spain. Apple Music lyrics includes both song lyrics, which appear onscreen while listening to tunes, and a search feature that allows users to find song titles by typing in a relevant string of words. Dynamic song lyrics debuted in iOS 10, while search by lyrics went live with iOS 12 last year. 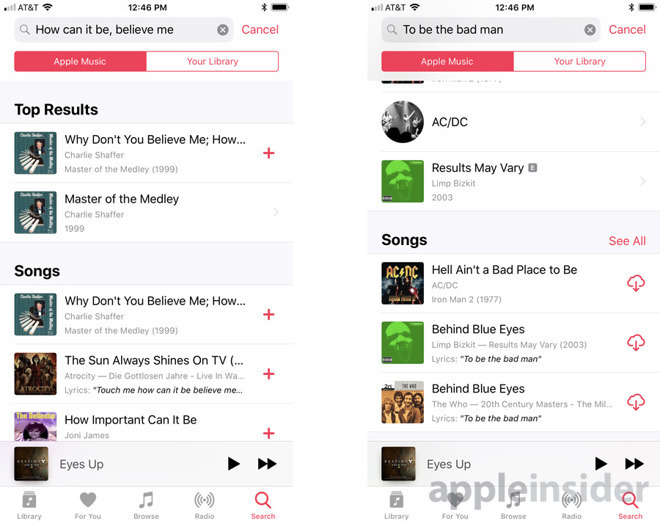 The latter feature lets users type in segments of a song, which are matched with Apple Music's lyrics database to identify a particular title. Prior to today's noted change, Apple Music lyric support was restricted to Australia, Canada, the U.S. and UK. Apple Music was relatively late to the song lyrics game -- Spotify featured integrated with lyrics and information provider Genius in 2016 -- but the tech giant's streaming service has made up significant ground over the past year. Beyond its own database, which is somewhat limited in scope, Apple Music last October partnered with Genius to expand the platform's lyrics catalog. In addition to hosted lyrics, the tie-up promoted Apple Music to Genius' official web-based music player. Nice to see the Emerald Isle get this feature. Now, Apple, please give us visual voicemail, HomePod and cellular WATCH! Surely anything is better than lyrics from teh Interwebs. I was amused a few years ago to discover that Megadave was actually singing "I vanquish the strangle horse that the netherworld sent for me" rather than "I vanquish the strangleholds that the netherworld sets for me."